Be the first to share your favorite memory, photo or story of Omie. This memorial page is dedicated for family, friends and future generations to celebrate the life of their loved one. 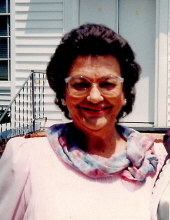 Graveside funeral services for Mrs. Omie Levonia Hudson, age 86, will be held at 3:00 P.M. Monday, March 25, 2019 at Dublin Memorial Gardens with Rev. Ron Bracewell officiating. Mrs. Hudson was born September 29, 1932 in Cadwell, Georgia; she was preceded in death by her parents, the late Robert Duncan Graham and Carrie Silas Graham and her husband, Andrew Calvin Hudson, Sr. She was a member of Pleasant Plains Baptist Church and was retired as Director of Nursing from Scott Health and Rehabilitation. Mrs. Hudson passed away Friday, March 22, 2019. She is survived by her children, Robert David (Patricia Beasley Hudson) Hudson, Andrew Calvin (Jennifer Lyn Hudson) Hudson, II, Cynthia Louise Douglas, David (Dawn) Pollett and Robert Nathan (Lisa) Hudson Ryan all of Wrightsville, 17 grandchildren and 12 great-grandchildren. The family will receive friends from 6:00 P.M. until 8:00 P.M., Sunday, March 24, 2019 at the funeral home. To send flowers or a remembrance gift to the family of Omie Levonia Hudson, please visit our Tribute Store. "Email Address" would like to share the life celebration of Omie Levonia Hudson. Click on the "link" to go to share a favorite memory or leave a condolence message for the family.